You are at:Home»Blog-News U can Use»Do you Know the Difference Between Strategic Sourcing & Category Management – Are You a Boxology Major? 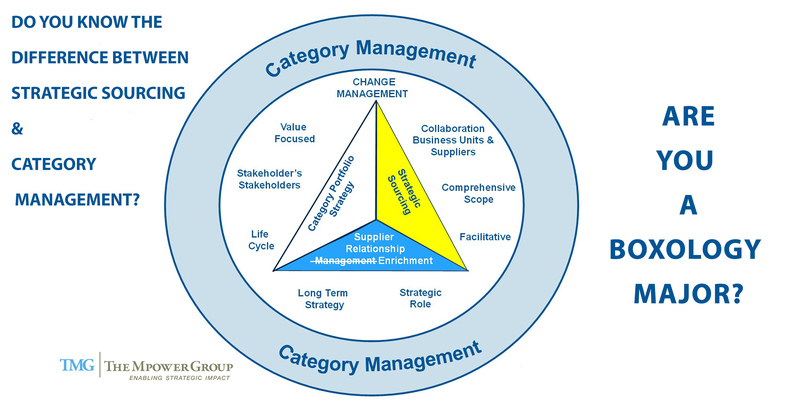 Do you Know the Difference Between Strategic Sourcing & Category Management – Are You a Boxology Major? Centralized, Decentralized / Consulted or Center-Led? Which organization structure is considered Next Practice? Regardless of the industry you are in or whether you are doing Strategic Sourcing or have matured to Category Management, any or all of these structures can work. We spend so much time paying attention to the boxes and titles that we lose sight of what we are really trying to accomplish – developing a structure that allows us to meet our goals in an efficient and collaborative way. Designing an organization should not be an exercise in “boxology” (drawing boxes and putting together org charts); rather an attempt to organize your talent to leverage their skills and competencies to maximize effectiveness. In other words, it’s more important to define what happens between the boxes than drawing the perfect picture. The Procurement function is unique because we function as a shared service that may play different roles in different categories. We may centralize certain areas of spend like office suppliers / equipment, may decentralize / consult on other categories like HR and may create a center-led model for areas of spend like Information Technology. How do you decide? 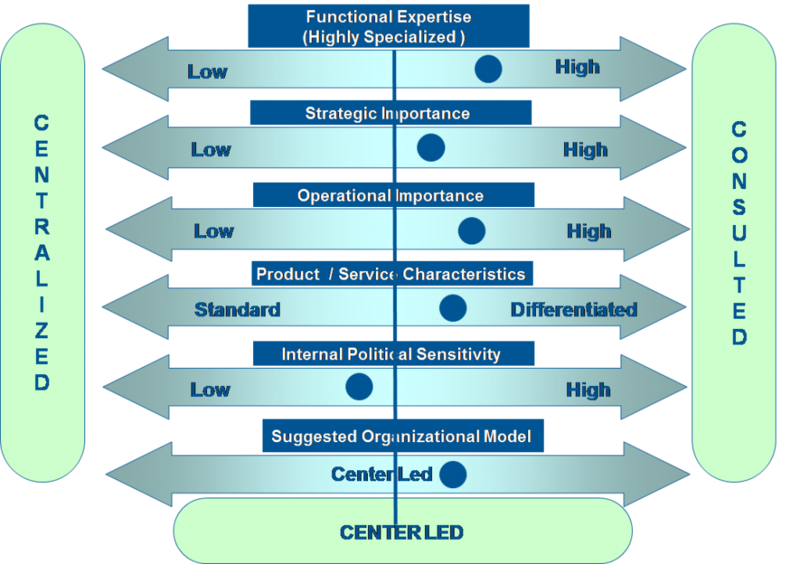 The attributes used to determine the org structure in this model should be customized based on what is important to your company and completed for each major spend category. Going through this exercise helps you think through the most effective way, organizationally, to have an impact on the spend, leverage the skillset of your organization and ensure buy-in from your internal customers. You should do this BEFORE you even think about drawing boxes on an organization chart. ANY, ANY organization model will work. It’s not how you draw the boxes but how you ensure the boxes work together to meet your goals and objectives. If you are having issues with your internal business partners, you may need to look at the way you are engaging them not what your organization structure looks like. Centralized, Decentralized / Consulted or Center-Led? It should be about collaboration and impact not an exercise in “boxology”. Let us know what you think and join in the conversation . . . . .